Why is it that breakfast always seems so much better sounding than any other meal? Breakfast is a meal that a lot of people crave all day long, while some even have breakfast for dinner. It feels a bit daring but also is quite satisfying too. The only thing about having breakfast for dinner is that a lot of breakfast foods can be on the sweeter side. When it comes to eating sugar the body can tolerate it more at the beginning of the day than later in the day. This is mostly due to the fact that a lot of us aren’t active after dinner. After dinner means, getting some more work done, sitting on the couch watching TV, getting the kids to bed, etc. However, this is a breakfast we are taking off of the pages of one of our EBOOST Ambassadors, Keegan Michelle’s, book that you can have for dinner without any guilt with it still being super delicious too! ***Topping these bad boys with some Greek yogurt takes the protein level up a notch while giving the waffles more moisture instead of dousing them with maple syrup aka sugar. Prep your waffle iron before starting to mix the ingredients. I put mine on level 4 of 7 and it made cooked them perfectly. In a medium bowl, whisk the egg whites until a stiff peak forms. Meanwhile, in another medium bowl combine the dry ingredients. Add in the almond milk and vanilla extract until completely combined. Gently fold in the egg whites until practically combined. Don’t over mix or mix too hard as that will collapse the egg whites which is what gives these waffles their volume. 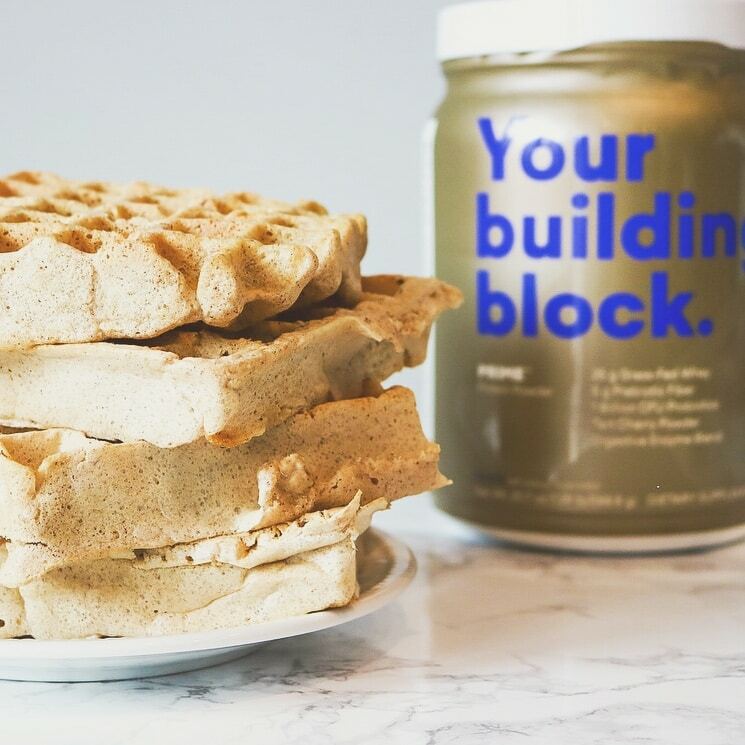 This recipe would also work well with our EBOOST PRIME, chocolate flavor too–just depends on if you are looking for more a neutral tasting waffle or craving a bit of chocolate in your life.